Click "Sponsor Now" to add John (Twin) to your order. John is growing into a big boy who loves to play with balls and run around. 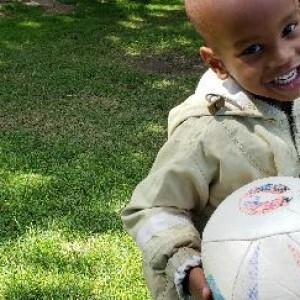 He and his identical twin brother Joakim arrived at the Nkoaranga Orphanage when they were 4 weeks old, after their mother passed away during child birth. The twins are now the oldest residents at Nkoaranga Orphanage and enjoy playing outside with the preschool class. We are looking forward to seeing these beautiful boys grow into their own personalities, and are confident that with the continuing support of the Mamas and volunteers, John will grow up to be a happy, healthy, and successful boy!